Doctors help the body heal. The body does the work, we just provide the help. It is now time for us to help the country heal. The country must do the work, but we can still provide the help. This morning, I read a wonderful blog by Aaron Stupple, MD et al (“Doctors to Donald Trump: First do no harm“), which inspired me to move. Yes, our country is divided. Very divided. More divided than ever in my own lifetime. And those divisions have caused immense damage to our country. You and I might not agree, but I would like to have a civil discourse with you. Communication. Conversation. Open-mindedness. Our country cannot heal until we begin to embrace these notions. Let us reach out to those with whom we disagree and tell them that we are with them as Americans. Let us tell them what we will do to help our country move #TowardsHealing. Let us ask them what they will do to help our country move #TowardsHealing. We have no greater calling on this planet than to help others. We are trained to help other people. Let us use this calling to help the country by joining together #TowardsHealing. Hint: As the presenter is speaking, I will often create a blank tweet structure specific to the presentation (e.g., Kestens #52: #DDW15) leaving 2 spaces after the colon so that I can paste it into my tweet, click between the 2 spaces, then begin typing. What you should tweet really depends on your personal or professional goals. I like to tweet important points or new information, but be aware that abstract presentations have not necessarily been subjected to the same peer-review process of a scientific paper. Good luck and happy tweeting! Yes, it may seem like semantics. Yes, it takes a few extra seconds and a little bit of effort. I’ve personally had to focus on changing my own lexicon and occasionally find myself resorting to my older habits. But if you pay a bit of attention to colleagues from here on out, you might start thinking about how it sounds and try to make the change yourself. 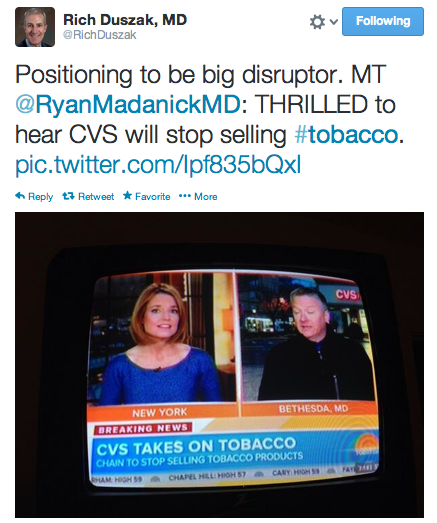 CVS has announced it will stop selling tobacco products! Whether or not the petition has anything to do with it I will never know. Nonetheless this is a huge step forward. As @RichDuszak tweeted back to me this morning, this is truly a disruptive announcement and hopefully lead to other pharmacies and retailers following suit. I applaud CVS for taking this bold stance and eschewing approximately $2 billion in revenue to follow their healthcare mission. My gastroenterologist says s/he can’t do my endoscopy and colonoscopy on the same day. Sometimes it’s because it was considered too “dangerous”. Occasionally it’s because “that’s not the way we do it”. Sorry, that doesn’t fly with me. And it shouldn’t with you. Yes, there are true medical reasons that some people shouldn’t have an upper endoscopy and a colonoscopy (sometimes called “bidirectional endoscopy” or a “double dip“) on the same day. But these are few and far between. Years ago, my mother told me the same thing…after her procedures. I nearly flipped out. The real reason is that (in the USA) the doctor and/or the facility gets paid less for doing them on the same day than when they do them on different days. What does having your 2 procedures done on separate days mean for you? If you do need to have both done, think carefully. A patient-center doctor would usually have no problem doing them both on the same day, instead of caring more about the bottom line. In this week’s JAMA, Scott Braithwaite, MD, MS wrote a Piece of My Mind editorial, “EBM’s Six Dangerous Words,” which made me think back to a former blog post of mine from 2011, “Doc, can I use this natural supplement?” What I omitted from the original blog post was germane to Dr. Braithwaite’s point. In academic medicine, we often derate complementary/alternative therapies because of the lack of evidence for their benefits, until they are “proven” to be beneficial. Yet some patients rely on them because of the actual or perceived benefits the therapies provide, as my patient had done. While I am not advocating the indiscriminate use of uninvestigated treatments in managing patients, I advocate maintaining an open mind about why our patients choose to use the remedies they do. On the other hand, we do not have to recommend or prescribe therapies that have no or little scientific evidence supporting their benefits, as some practitioners often do. However, in the absence of significant harm, we should restrain ourselves from telling patients to stop or avoid such treatments if our patients feel they gain benefit from them. I have heard students, residents, and colleagues say the very words Dr. Braithwaite decries: “There is no evidence to suggest…” when deciding on treatment or in looking at another physician’s prior decisions when consulting on a new patient. As a clinician educator [and in full disclosure, I have probably said those very words myself], I often respond to their admonishments by citing the infamous Parachute article from the 2003 Christmas issue of the BMJ. Most of what we do in medicine is unsupported by evidence. We need to keep this in mind as we see patients, especially as we teach and train the next generations of physicians.